‘What I cannot create, I do not understand’, were the words written on the chalkboard of Nobel Prize winning physicist Richard Feynman, the day he died. Synthetic Biology (SynBio) applies this idea to living things. We are a team of undergraduate SynBio researchers from Trinity College Dublin. We are using DNA, the language of life, to design and engineer living cells. Our team is preparing for the International Genetically Engineered Machine (iGEM) competition in Boston this October. 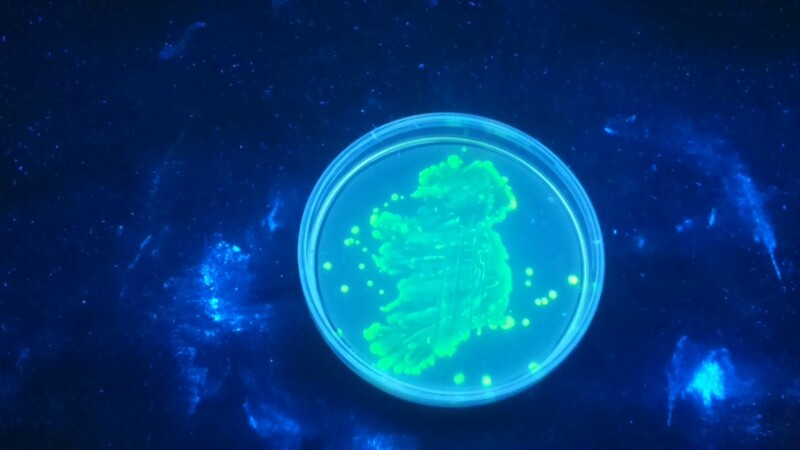 At Dublin Maker, we will demonstrate SynBio by turning bacteria into living ‘paints’. The ‘paints’, as seen above, are proteins made by ‘transformed’ E. coli bacterial cells. To transform bacteria, we select segments of DNA, the code for the machines we are building, and insert them into the bacteria by mixing them together. For Dublin Maker, our DNA codes for fluorescent proteins that glow under UV light. Using different variants of DNA, each encoding individual colours, we may design a range of bacteria producing a spectrum of colours we desire. We then simply apply the cells onto an agar plate. 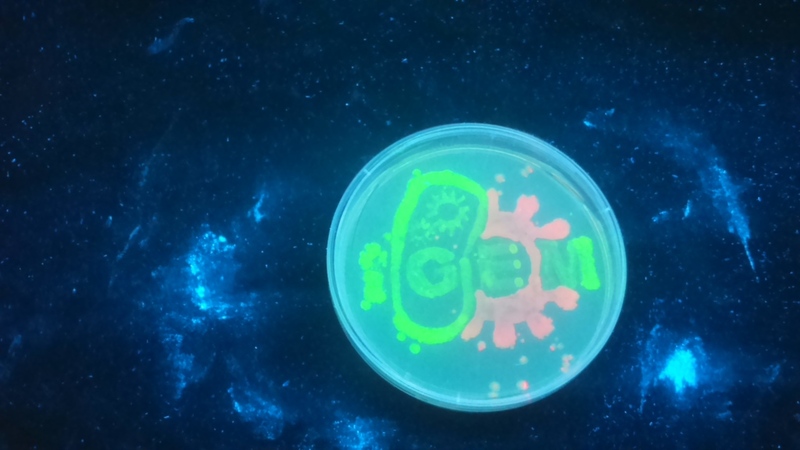 After overnight incubation, the drawing then emerges on the plate; which can be seen more clearly under UV light. Working on this BioArt is ideal preparation for the research we have planned over the summer. We will transform E. coli with genes helping to produce the anti-malarial drug ‘Artemisinin’. As well as this, we are trying to improve the ground-breaking gene-editing tool ‘CRISPR’ in E. coli with a recently discovered protein called Cpf1. This work may sound complicated, but it is essentially the same principles used in our BioArt. For painting, we transform bacteria with a simple set of colour encoding genes. To fight malaria, improve gene-editing, or build anything we can imagine, we just need to assemble the genes.